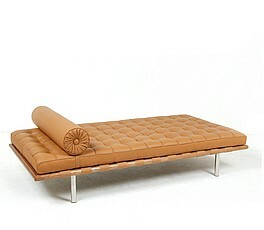 Daybeds are one of the most iconic looks of the mid century modern furniture movement. There are a couple of mid century daybed designs that really catch the eye. The Eileen Gray Daybed is considered the turning point for Gray in her formal and expressive language. 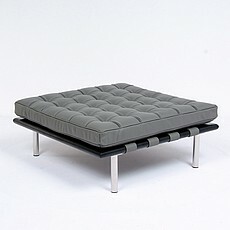 Her daybed is an example of Gray's affluent take on the stark modernist aesthetic. Until her death, Eileen Gray was fairly unrecognized for most of her career but is now regarded as one of the most influential 20th century designers and architects. 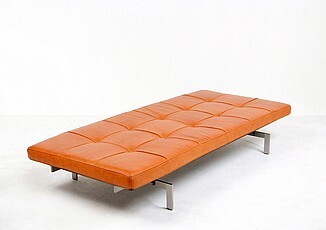 Likewise, the PK80 Daybed is an iconic mid century modern daybed. The PK80 was designed by Poul Kjaerholm in 1957 and is widely considered as one of his most sophisticated works of this period. Its striking proportions, the elegance of its materials and construction, and the beauty of the large welted leather mattress all come together to produce an iconic work and one of Kjaerholm's finest creations. Last, but not least is our Exhibition Daybed was inspired by the design of popular Mies van der Rohe Sofa, also known as the Barcelona Couch. This design was first introduced and recognized as a signature modernist furniture model in architect Phillip Johnson's New York apartment. Our daybeds are made with high-quality materials. 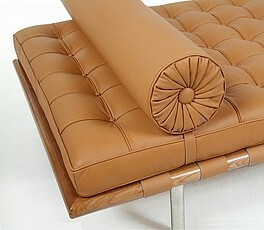 We use top-grain, Italian leather. Each piece is cut and hand-sewn using a hand-rolling welting technique not found in other versions on the market. The inside cushion is high resilient, high-density polyurethane foam for extra durability. All of our frames are made of durable stainless steel.